Well I was shocked to find out that after having 5 single birth children, I was now expecting twins! Mono Mono twins that are quite rare from what I understand. 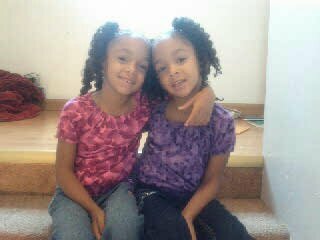 My twins are 5 now but still I am amazed with them. I was considered such a high risk that I was told to check into the hospital at 22 weeks, which I declined to do because I had other children at home. I was closely monitored, (2 ultrasounds and 3 stress tests a week). I had a good pregnancy and delivered them both vaginally at 36 1/2 weeks. No complications and both babies were born strong and healthy. Truly blessings from God. The doctors were glad it was over because I wouldn't do anything they wanted me to do. I trusted God and prayed everyday for my babies. Now, 5 years later, we have so much fun together. I love to just watch them play and talk to each other in their own little twin language. Even though they are supposed to be identical, I treat them as individuals. They do look slightly different as well as act and sound different. They are very smart. They turned 5 in March and know the alphabet, all the numbers, colors, shapes, how to read and write their full names as well as family and friend's names. And, they just learned how to tie their shoes! As surprised as I was in the beginning I'm very proud to be a mother of Mono Mono twins! I really appreciate your story I am also a Mother of five now I'm having my mo mo twin girls and have never been so excited my children's father recently passed right after I found out I was pregnant and I really don't have help from anyone the doctors want me to do so much that I am not agreeing with so thank you for your story it gave me that extra push I needed I already know God And their Daddy is taking care of them doctors just can't understand that. Hi I am just under 10 wks prego with mono mono twins. I went into my US expecting to see one little baby only to see two and then to hear that there was no membrane was scary. My husband looked at me like what does this mean. Being in the medical field I didn't know what it ment. We have a little 2 year old girl and I have read so many stories and articles on what to expect. But they don't tell you from a person aspect. I fear the 50/50 chance or something else going wrong, but I mostly fear my 2 year old not understanding that I may be hospitalized for weeks. That its self scare las me to be put in the hospital on bedrest for weeks being away from my home and family. I was wondering if u could express how the pregnancy was, and what you went through while having other children at home. Also are there any questions I should be asking my high risk Doctor? Any info will help. I have been so stressed that I feel we haven't really got to enjoy that we are having a rare set of twins. Thanks for listening and hope to see your thoughts. I see this story has been out here for quite some time, but I am so grateful that you posted it! I am 10 weeks and 3 days pregnant with mono mono twins. After seeing and hearing so many negative stories, it is wonderful to read this!! I am also believing God for a successful pregnancy with two healthy babies! I'm also a mother of mono mono twin girls. They were born 28 weeks and I slipped into a coma after giving birth. My girls also look slighty fferent, totally different personality..so cute!! I cant help but cry when i read your article. Just this morning i was diagnosed to carry mono-mono twins... Your article inspired me to have faith in Him. Thank you! You're doing something right as a parent so give yourself a pat on the back!